Jason Welborn wants a shot at the British title before the end of next year after beating Terry Carruthers to become Midlands area champion. Their light-middleweight bout on Thursday was stopped midway through to the eighth round after Carruthers suffered a bad cut above his left eye. "As soon as his eye opened up, I knew I was going to stop him," Welborn said. "I'll focus on bigger and better things in 2014. 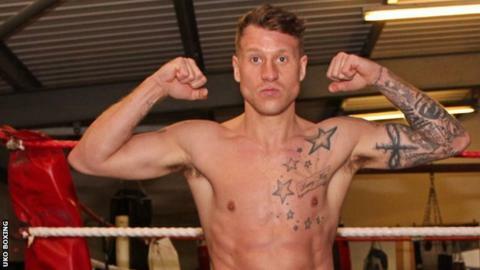 I want a shot at that British title sooner rather than later." The fight's status as an eliminator for the British title put the 27-year-old Tividale fighter a step closer to a potential challenge for Liam Smith's Lonsdale belt. Defending champion Carruthers was ahead on all three judges' scorecards when the referee called a halt to the fight after Welborn had opened up the cut with a heavy shot, giving him the win by technical knockout and taking his career victories to 14 from 16 fights. "I beat a good kid," Welborn said. "He was busy but never really hurt me and I was able to step up as the fight went on."